Part 4 of 4: Cross-section cut of the early stage in the development of a deadly poisonous Amanita (Amanita phalloides) fruiting body, with universal veil still completely covering the mushroom, placed next to mature mushrooms. 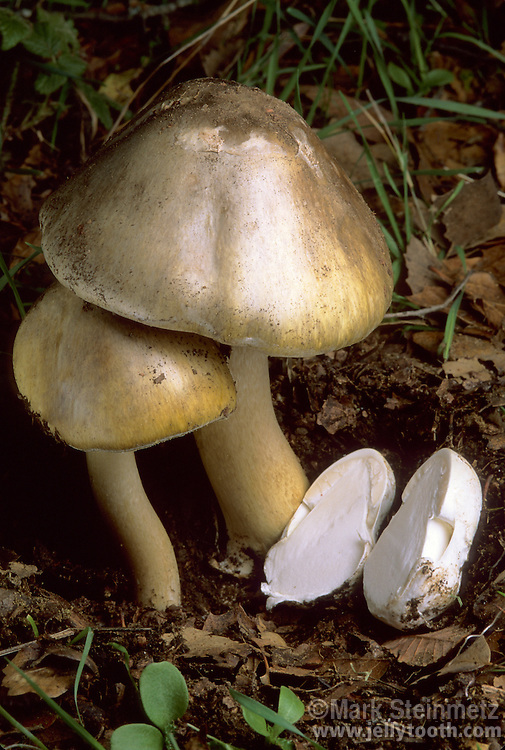 The developing cap, gills, and stem can clearly be seen, and would have soon pushed up through the top of the veil. Due to its superficial resemblance to a white edible puffball, such a cut should always be made before eating puffballs to eliminate the possibility of mistakenly eating this deadly mushroom and related Amanita species. Point Reyes National Seashore, California, USA.